Are you a fan of the World Cup games? Below are things that you may don't know about the World Cup. Read on to know more. It seems that exciting things happen when the World Cup is held in Mexico. Many have said that the 1970 season was the best Cup ever played, and has inspired an entire generation to begin playing football. Various playing styles surfaced and met each other head on, culminating in a gruelling final between Italy and Brazil. The Italians were highly physical players, relying on dynamic force to get them through, while Brazil’s fluid pass-based playing style was a stark comparison. Brazil won, setting the standard for how football would be played in the years to come. This amazing Cup also bid farewell to one of the greatest players of all time- Pele. The 2014 World Cup this year saw Brazil take a beating like never before. They’ve been fan favorites, held a perfect attendance record for all the World Cups, and yet they received a thrashing against Germany, not even making it to the final 3 teams. Rubbing salt in the wound, Brazil was this year’s host! Put away your cries of outrage, however, because Brazil wasn’t the only host team to have difficulty playing on home ground. As the host of the 1982 cup, Spain didn’t even make it to the championship, and neither did Germany in 2006. It seems hosting the Cup puts tough pressure on the teams. There’s always 2018 for Brazil! Football began in Europe and has spread in popularity throughout the world. While the World Cup has been going on since the 1930s, only recently have Asian countries shown serious participation in the Cup. The first World Cup held on Asian soil was actually held in 2002, and it was also the first and only World Cup to have been split amongst two host nations- Japan and Korea. Clearly a season for surprises, this World Cup saw the favourites Argentina and France failing to qualify past the first rounds. Brazil’s incredible comeback pushed them to the finals, bagging the Cup for the 5th time. French powerhouse Zinedine Zidane was the highlight of the 2006 World Cup in Germany. The championship final featured Italy butting heads with France, and Zidane took this quite literally. Carded in the 110th minute for head butting Italian Marco Materazzi, he was sent off the pitch. Despite this, Zidane was still awarded the 2006 Golden Ball as best player of the season and rightly so. He may be hotheaded, but he’s also one among four players to have ever scored in two different World Cup finals. The other three players are Paul Breitner, Vavá, and the great Pelé. Zidane’s also definitely the only player to have been carded and awarded in the same World Cup! The World Cup is a celebration of camaraderie, global competition, and culture. Since the World Cup first began in Uruguay in 1930, it has never ceased coming by every 4 years, except during the Second World War. There was a gap between the 1938 World Cup in France and the 1950 World Cup in Brazil because the world was busy throwing more than just inflated footballs at each other. Since it’s resumption, there have been 20 Cups held in total in various places across the globe- Europe, Asia, America, and even in South Africa 4 years ago! 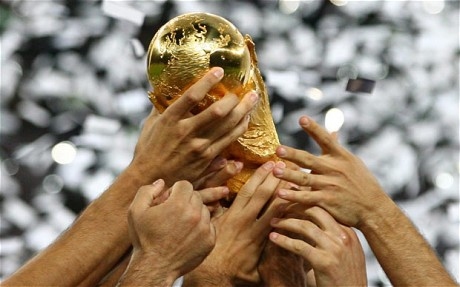 The World Cup only comes by every 4 years. There’s only so many Cups one football player can participate in during his career, so he better make the most out of it. The highest number of World Cups that a single football player has participated in is 5 so far, and only 3 players have ever been able to do this: Antonio Carbajal of Mexico, Gianluigi Buffon of Italy, and Lothar Matthaeus who played both for the Federal Republic of Germany and for Germany as a whole after the Berlin wall fell. Matthaeus is also the current record holder of Most Appearances in a World Cup, playing 25 times in total. What a hardworking guy! The year 1986 saw some pretty dramatic occurrences. Before the World Cup began in Mexico, the space shuttle Challenger exploded. A few months after that, the Chernobyl nuclear disaster occurred. When the World Cup of 1986 kicked off, people seemingly forgot their woes and glued their eyes on the man of the match- Diego Armando Maradona. This was the year Argentina was put on the map for football. With Maradona’s amazing skill, he almost singlehandedly bagged the Cup! Some have even said he dragged Argentina to the championship, winning against Germany 3-2 in the final. No wonder 2014 Golden Ball winner Lionel Messi looks up to the man so much, he even has the same jersey number! If the World Cup were a high school class, Brazil would win an award for perfect attendance. Since the World Cup began in Uruguay in 1930, Brazil has never failed to qualify and play in the tournament. That’s a record of 20 World Cups in which they’ve participated. No other country has been able to say the same. While Brazil hasn’t always won, they’ve certainly held the championship far more times than anyone else has with 5 World Cup wins to their name. With such avid devotion to the sport, Brazilians truly go crazy for football! While you haven’t seen them in the final rounds of the past few World Cups, Uruguay has been a key player in World Cup history. Having been the reigning Olympic champions in 1929, the FIFA congress of that year chose them to arrange the first ever World Cup. Uruguay also began the trend of building tremendous stadiums for the event, putting up the Montevideo stadium with a capacity for 95,000 spectators. Football fever wasn’t as crazy then as it is now, of course, what with only 4 European teams making the trip out to participate. Despite this, it marked the first of many World Cups, and thus began the entertaining madness that visits the world every four years. While this 2014 World Cup has seen remarkable feats, the fact that Germany won it is quite possibly the biggest record breaker. Of all the previous World Cups hosted on South American soil, none have resulted in a non-South American team bagging the championship. The four World Cups hosted in Mexico (1986), Chile (1962), Brazil (1950), and Uruguay (1930) were bagged by teams from South America, quite often Brazil. For Brazilians to host the World Cup and face astounding defeat at the hands of the Germans is surely one big game changer!